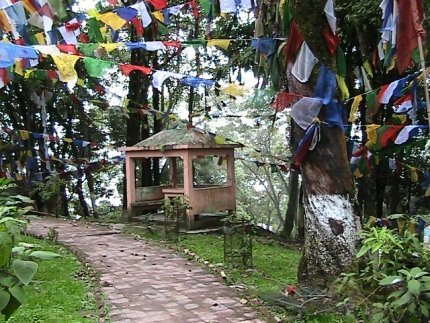 As the name suggests, this place on a hill top is one of the greatest spots in Darjeeling to observe the panoramic views of the mountains and it also has a temple at the summit called the Mahakal Temple. The Observatory Hill is located at the Mall area and is encircled at its bottom by the Mall Road. As you walk along the Mall road, you will see this steep hill rising on one side. However, it's not too high. It takes about 15 minutes of uphill walk to reach to the top. While the walk may be tiring, the rewards are awesome. As you take the Mall road from the right side of Chowrasta Mall, about 100 yards away you will find flights of stairs that lead towards the Observatory Hill and the Mahakal Temple. There is a large signboard indicating the pathway. Soon after few flights of stairs, a steep uphill narrow road starts that goes all the way to the top. Older people may not find it easy to climb the stretch. Every time as I walk down the hill after a visit to the summit, I would meet some seniors on the way going up and looking at me with questioning eyes. I know what they want to ask. How far is the top? I would say, just some more distance, you can make it, it's awesome out there and the temple is great! If you are really out of breadth, there are benches on the way to take some rest. As you walk along, there are sharp bends on the way. Halfway up, you will see a private property with some lovely cottages and an open patio to lounge in the sun while taking breathtaking views. That's the backside of Windamere Hotel, a grand heritage property of Darjeeling. 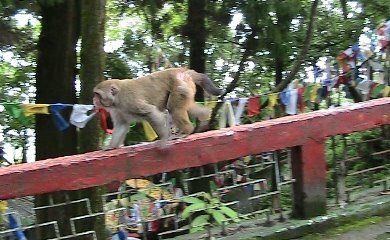 As you walk along, you will see lots of monkeys particularly when you are closer to the temple. In fact there is a sign board near the entry saying "Beware of Monkeys". So what does that mean? It means that you should not openly hold food and other small stuffs loose. There is a good chance that soon the monkeys will be holding them in their own hands, and eat or throw them right in front of you. Otherwise there are really no threats. They are more used to human beings than we are to them. On the last bend to the top, you will find a priest sitting at a small temple on the roadside. That's the temple of Siddhi Sai Baba. And this man Baijanath Pandit can share with you all the stories you may like to hear about the temples in the complex. Right next to it on the right is the Hanuman Temple. Soon you will see the gate to the main Mahakal Temple and the summit of the Observatory Hill. The main Mahakal temple is that of the Lord Shiva. When I asked why the name Mahakal, Baijanath told me "Kalo ka kal, Mahakal" ... I don't know what that really means. The temple with three Shiva Lingas is said to have self manifested itself in the year 1782. The three gold plated icons stand for Brahma, Bishnu and Maheswar. Mahakal temple has a deep rooted history. This is where stood the original Dorjeling Monastery which is now called the Bhutia Busti Monastery. The original monastery was built in the year 1765 by the lama Dorje Rinzing. It was plundered and destroyed in 1815 during the Gorkha invasion. It was rebuilt in the year 1861 and later relocated to its present location about 1.5 kilometers (a mile) from here down below at a lower level. And today when you enter the Mahakal temple, you will not only hear the Hindu priests chanting prayers, you will also find Buddhist monks reading out from their holy scripts, both harmoniously coexist together. There are hundreds of Buddhist prayer flags fluttering all over and hanging from the trees. When I asked one of the monks, he told me that Buddhists believe the prayers reach the heavens through the flags. With changing seasons, the color of the flags and the prayers fade, which signify that with passing time, the sins will also be washed away. The devotees come here and walk barefoot three times around the temple and ring the many bells that are hung from the walls. Often you will hear religious songs being played in the temple complex. Next to the Mahakal temple is a white chorten or a Tibetan memorial shrine. 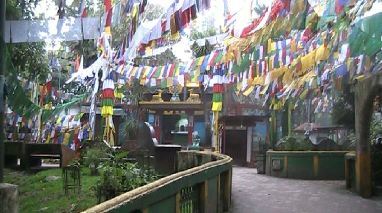 It has the relics of Dorje Lama who was the caretaker of the temple in 1880s. In fact there are many other small shrines and temples here. 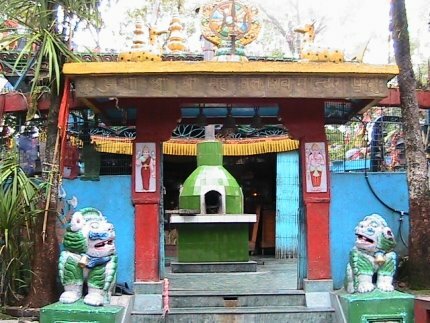 As you enter the complex through the arch gate, you will see a temple of goddess Kali on your right. There are also shrines of deities like the Durga, Ganesha, Krishna, Radha and others. Now about the view from the Observatory Hill. As you walk along the pathway that goes around the Mahakal temple, you will see shaded seating places made out of concrete. Those are the places from where you get the lovely views. On a clear day, you can see the entire range of peaks all around through the trees including the third highest peak of the world, the mesmerizing Kunchenjunga that stands solemn and majestic amidst fog rising deep down from the valleys. You can actually see as far as Sikkim and some twelve peaks from here, all snow covered and all having heights over 20,000 feet (or 6,096 meters). And on the slope of the hill that goes below down to the Mall road, you can see lovely colorful flowers on the lush greenery. Such awesome are the views. The Observatory Hill is actually quite rich in flora and fauna. It's a great place for bird watching. One thing remains constant here - the chirping of the birds. As you come out of the Mahakal Temple and start climbing down, close to it and after the first bend there is a cave called Mahakal Cave. You will see an yellow arch on the left. From here you will need to climb down some flights of steep stairs to reach the cave. To enter the cave, you will need to crawl. There are idols of Durga, Saat Kanya Bhagavati Devi and others along with a Shiva Linga in the cave. 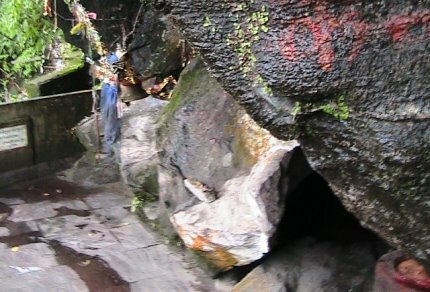 It is said that the cave is as old as the temple. Observatory Hill and Mahakal Temple is located behind the Chowrasta Mall and encircled by the Mall Road. The approach to the narrow road that goes all the way, is about 100 yards from the Mall and on the Mall road on the right. It's an uphill walk for about 15 minutes. Taxis and vehicles are not allowed in this area. Check out Darjeeling Map to see the location of the place. Update April 2015: GTA initiated Battery Operated Carts are now operating between Bhanu Bhawan (i.e. Gorkha Bhawan) on Mall road and Mahakal Temple during tourist season between 7am to 10am. A cart can accommodate up to 8 persons. One way rate is Rs. 20 per person. It makes several round trips. You can also reserve a cart for Rs. 500.